While the number of home sales in Highlands/Cashiers area have not climbed, buyers have shown a favorable increase in the purchase of higher priced homes. This would seem to indicate a stronger second home market is on the rise. At first, the above statement appears to be an oxymoron. That is, a statement that would contradict itself. So how can we say the real estate market for Highlands/Cashiers area is same but better? 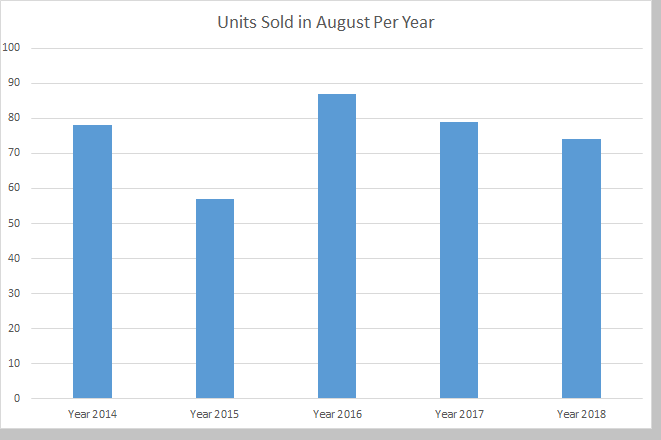 In August of 2017, Highlands/Cashiers Board of Realtors® showed 75 unit home sales. August 2018 shows 74. So these 2 numbers are relatively the “same”. However, we seen a huge swing in the price range of homes for August 2018 as compared with July 2018. For example, homes priced at $500,000 to $750,000 saw a 183% increase in sales. Homes sales over $1,000,000 saw a 37.5% increase. Our Median price range was at $488,500. The median has been increasing over the last year. While that number had been around the $250,000 range, it crept up into the $300,000 range. August was the third month in 2018 that saw this number above $400,000. So while we look at the above chart, we can see that August 2018 was not anything exceptional in the number of homes sold. 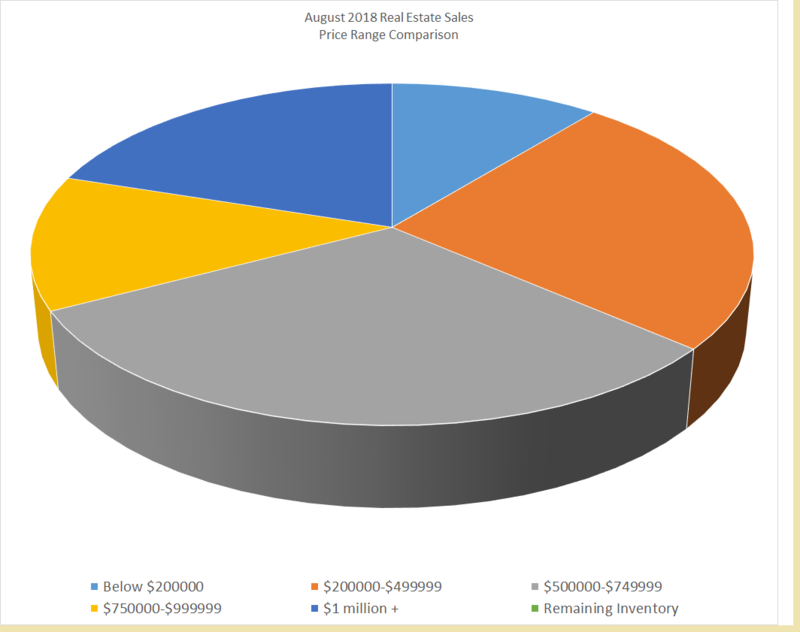 However, when we look at the pie chart below, we can see the market share some of the different priced homes held. Now recall at the top where we stated, “…homes priced at $500,000 to $750,000 saw a 183% increase in sales. Homes sales over $1,000,000 saw a 37.5%“. Coupled with this is the fact that our inventory has been reduced by nearly 40% compared with August of 2017. You can see how the dynamics of Highlands/Cashiers real estate is changing. A major factor to keep in mind here is that we are talking about home sales, not land. This, too, can seem like an oxymoron. However, what we’re talking about here is not the topography, but land sales. This month of August has shown typical land sales for Highlands-Cashiers area. In fact, the average unit sales for 2018 is 17 per month. This is unchanged from the previous 2 years. Inventory is still high, based upon these unit sales. As a result, one should not expect any better sales results for land than has been seen over the last several years. There’s just no real demand for land. This keeps prices low, regardless. What can one do to increase the opportunity to sale their parcel? Survey – No one wants to incur this cost. However, if boundaries are not clearly marked, how does a buyer know what they are purchasing, unless there are neighbors on either side. Show Potential – Does the lot have a view? Then you need to be able to see it. Listing a lot saying, “With View Potential” does not have the same effect on a buyer as a lot that has been opened up and the view is clearly seen. Clean Up – You wouldn’t want a potential buyer for your home coming in to dirty dishes, trash piled in the corner, etc. Your lot is the same. If it’s overgrown and can’t be seen, it loses any appeal. After all, why did you purchase the lot in the first place? Price Correctly – This is the same whether selling a home or land. If you’re “on” the market, but not “in” the market you’re wasting your time. Buyers don’t buy just because you have a price and listed your property. There has to be demand and a reason they will purchase your lot. If you price like everyone else does and nothing is selling, then there’s no demand for property in that price range. These are just a few selling tips for land. No demand means pricing must be low enough to attract a buyer. Synopsis: The overall numbers are strong. The biggest factor is the Average List/Sell Ratio. That is, homes are selling for about 90.56% of the price for which they are listed. This is a very bad ratio. The basis for this is overpricing of homes. This has a negative effect for Sellers and creates higher Days On Market. Brokers sometimes feel forced to take a listing for what the homeowner says. However, this benefits neither. You can contact a Pricing Strategy Advisor Here to ensure your home is priced correctly. Synopsis: With a high inventory on land, pricing will remain low. Although building and construction have sharply risen in the area, these are people who have owned lots for years and finally starting to develop on those lots. New land sales are still very low. 25% of home sales ranged from $200,000 to $499,999. 31% of home sales ranged from $500,000 – $749,999. 13% of home sales ranged from $750,000 – $1,000,000. 20% of sales were above $1,000,000. The big winners for July were the homes between $500,000 to $750,000. Those sales had an increase of 183%! These make up the largest portion of the Market Share. BUYERS: There is a swing in motion. The Highlands, Cashiers and Glenville area has long been sought after because of its quiet communities, cooler temperatures and mountain lifestyle. Pricing has been at its best for the last several years. However, it seems the market is catching up. It would seem the best opportunities may be passing soon. At current trends, next years pricing may soon be a thing of the past. It may be wise to take opportunity now before the next selling season begins about April. SELLERS: This is welcomed news for Sellers as inventory has dropped. We are moving into a slow time of the year with the last push of Buyers coming into the area for our “leaf” season. Be sure you are priced correctly to attract the last of our Buyers or be prepared to wait for the 2019 selling season. To ensure you’re priced correctly, contact a Pricing Strategy Advisor. CONCLUSION: There are strong indicators that the real estate market for Highlands, Cashiers, Glenville and Toxaway area are changing to a Sellers Market. While it’s not there yet, things may easily change for 2019. We shall see. Selling Homes in Highlands, Cashiers, Glenville and Sapphire Area, as well as Franklin and Sylva. Contact Listing Agent Here. This material is based upon work performed by Rick Creel, Broker. It is intended to provide an overall view of the real estate market for Highlands, Cashiers and surrounding areas of the Highlands/Cashiers Board of Realtors. It is composed of data from the HCBOR and NAR for this MLS only. Any opinions, findings, conclusions or recommendations are those of the author and do not reflect the views of any others. There can be no assurance that this information is complete, accurate, or includes all available market data; all information is subject to change. Users of this information are advised to consult with their financial experts about the interpretation and usefulness of information contained herein. For more information or to consider listing your home with an agent or buying a home CLICK HERE.